I went out to the woods a few days ago, in search of the California Polypody fern. I was looking for it, because it had rained, and I wanted to find it, and to make you a drawing of it, and give it to you. I think, though, that I have looked in the wrong season; I should have searched in the Fall. 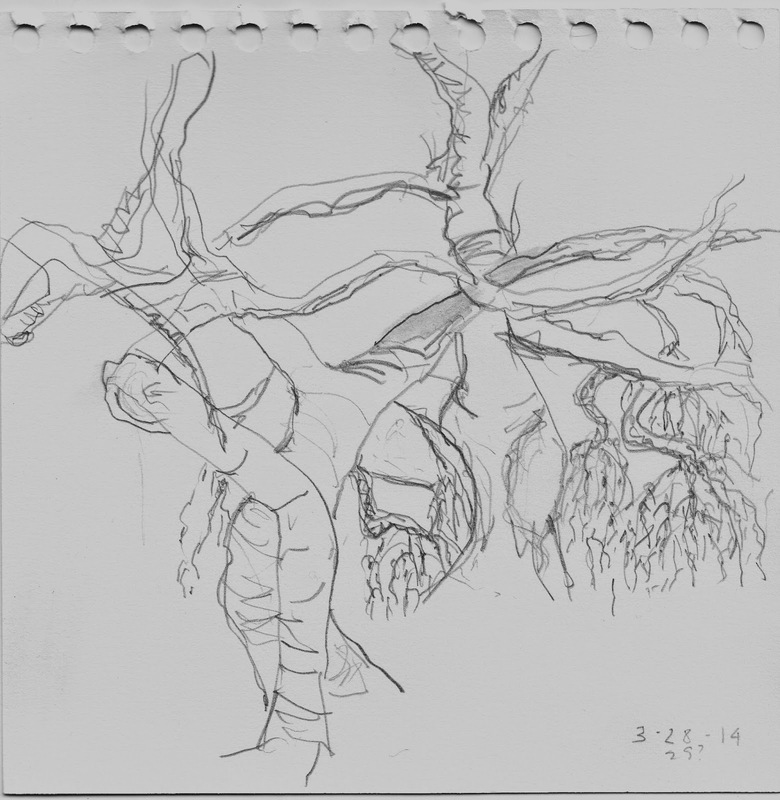 However, I made you a drawing of the pygmy Coast Live Oak trees, which grow in the El Moro Elfin Forest not too far from here. "Elfin" here refers to the oaks which are small and specialized, growing slow and low, in response to their specific habitat of coastal dune scrublands. They are shrouded with palest grey-green lichen, which drips the fog down onto their roots, just below the swift-draining coppery colored sand. The Elfin forest could not be more delightful if it did have elves, though, and many beautiful native plants flourish there: Buck Brush, California Coffeeberry, Fuschia-flowered Gooseberry, Morro Manzanita, Silver Dune Lupine, Sticky-Monkey Flower, Black Sage, California Peony, and many more. 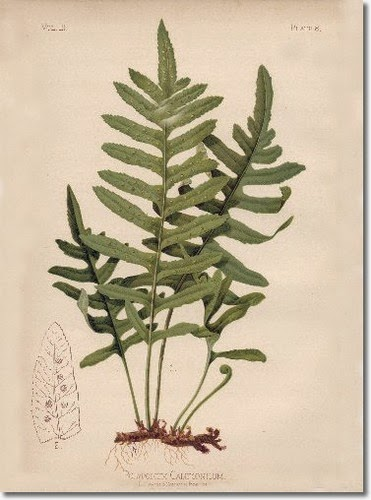 California Polypody Fern is another of them- I read about its fascinating reproductive cycle in the newsletter of our local chapter of the California Native Plant Society. Have you gotten to know your own natives? You must introduce yourself to them- you will love them. They have diverse and wonderful qualities that keep them thriving in your yard with hardly any coaxing or cajoling. They are convivially adapted to growing in communities, among their friends and relations. Their very habits bring out the best of your locale- Local birds and insects and animals love them. I love to watch them grow and prosper, and I they look well in our light, in our soil. To be sure, I have some of these other, non-native plants growing too- many of them struggling with the climate each year, duking it out with the heavy clay soil; others languishing beautifully like consumptive Camilles. But the natives are more in tune with the space they inhabit. They are happy here. I believe they offer us a moral, these native plants.... The message of their thriving might be this: go grow in your companion habitat, or plant yourself in the proper region. Because you may find you are sitting forever in a bar next to someone named Bill, or Billy, or Mac, or Buddy, and this may not be your true and best habitat. But Billy won't be asking you to leave. You will have to say goodbye to him on your own, and then, when you have settled yourself among the glorious and thriving native plants, those other flowers, shrubs and trees, the sensitive and exotic Camilles, will just be so many somebodies that you used to know. Thomas Meehan, from Flowers and Ferns of the U. S., 1879. 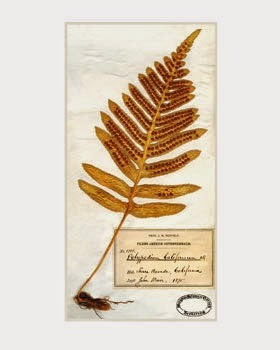 This specimen of California Polypody was collected by John Muir. More on Muir's collection, here. Looking for further introduction to California's native plants? Here is the excellent website of the native plant propagator and purveyor, Las Pilitas Nursery: www.laspilitas.com. Another great person, writer, advocate, grower, and resource for California natives is Judith Larner Lowry: www.larnerseeds.com.